This elegant painting and Lady enticing a peacock with a strand of pearls [1996.67], both from the collection of the late Jacqueline Kennedy Onassis were executed in the Punjab Hills in northwestern India. The lyrical forms of these lovely women in refined architectural settings overlooking vast landscapes are typical of this school of painting, often referred to as "Pahari," meaning "of the hills." The long stitched gowns and diaphanous veils draped over the shoulders of the women in both paintings are also characteristic of dress in this part of India. The painting of the woman with a hookah shows her feeding an Indian ringneck parakeet, a type of bird that in India is commonly called a parrot. At first glance the bird is not easily visible, since its green plumage blends in with the foliage behind it. However, popular literature suggests that the presence of this parrot may be an allusion to possible danger. Parrots in Indian literature are associated with wisdom and the ability to avert potential disastrous calamity. In the Tuti Nama, the Book of the Parrot, popular in early modern India, an intelligent parrot saves the honor of a married woman by keeping her from meeting with her lover by night .The parrot tells her a story that entertains her until dawn, at which point no respectable woman can go outside. The setting, the full bloom of spring, indicates a time of desire and yearning for love. 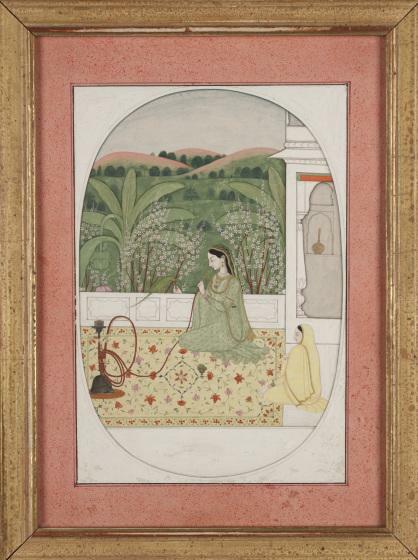 That she is smoking a hookah suggests that her life is humdrum, while her close relation with the parrot indicates that she is thinking of going beyond the terrace of her elite mansion. These paintings evoke emotions and moods through elegant forms, delicate pastel colors, and women whose isolation from others, even in the illustration in which a servant is present, suggests a mental and physical loneliness that the informed viewer would more than understand. 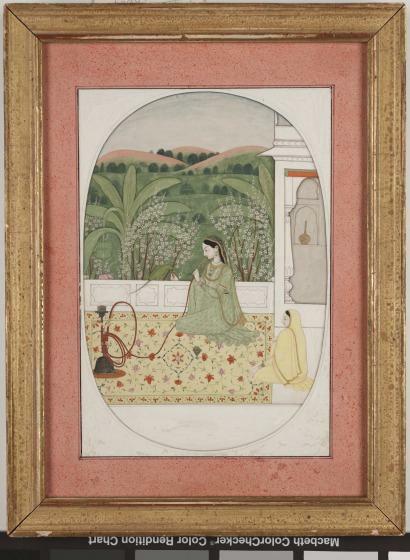 Catherine Asher "Lady enticing a peacock with a strand of pearls" and "Lady on a terrace with a hookah" in The Arts of India, South East Asia, and the Himalayas, Anne R. Bromberg (Dallas: Dallas Museum of Art; New Haven: Yale University Press, 2013), 125-126. Learn more about the significance of parrots in Indian literature and painting.